A peaceful demonstration against the shooting to death on Thursday of a twenty nine year old local man, Mark Duggan, turned into a full scale riot on Saturday night in Tottenham. Two police cars, a bus and several shops and residential buildings were set on fire on Tottenham High Road. Shops were also looted on the High Road as well in Wood Green and at Tottenham Hale retail-park. The area of Tottenham High Road where the worst rioting took place was still cordoned off on Sunday evening. Police said that forty eight people had been arrested. Initial reports of casualties have been confined to the number (26) of police officers injured, but it is almost certain that the number of civilians injured will exceed this figure, as tends to happen in disturbances of this nature. The police have said that a pre-planned attempt to arrest Mark Duggan on Thursday night, when he was traveling as a passenger in a mini cab, resulted in a shot being discharged from inside the mini cab, and armed police responded with two shots, killing Mr Duggan at the scene. But this version of events has been questioned by members of the dead man’s family and friends, which has led many people in the local community to be sceptical about the police’s version of events. 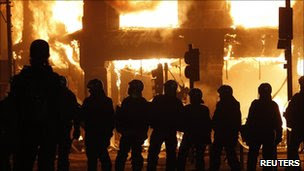 Tottenham, of course, has a history of community/policing problems, with the Broadwater Farm estate riot in the 1980’s the most dramatic example. Feelings of harassment and mistreatment by police have simmered for years amongst the mainly Afro-Caribbean community. At the 2005 General Election, the RESPECT party stood a candidate, Janet Alder from Birmingham, whose brother had died in police custody, and she got almost 8% of the vote. The Independent Police Complaints Commission will investigate the circumstances surrounding Mr Duggan’s death, so hopefully we will get the true story eventually. Metropolitan police press releases in the immediate aftermath of deaths at the hands of its officers are to be treated with some caution. When Ian Tomlinson was killed at the G20 protest in the City of London in 2009, much misinformation was put out to the media, and we probably would never have known the truth if the incident hadn’t been captured on a mobile phone. Similarly, when Jean Charles De Mendes was shot to death in the wake of the London tube bombings, the Met’s media team set about sullying his name and spreading false reports of his behaviour on the day he was killed. Why on earth do the Metropolitan police need around fifty press officers, as was revealed by inquiries into the News of the World phone hacking scandal? The police now seem to spend much time and money on media operations and playing politics, when they should be concentrating on policing and building links to communities. Condemnation of the rioters has come from all of the establishment politicians and of course riots generally are not a good idea, for communities as much as anyone else, but let’s just get the facts about what happened first, before we jump to the conclusion that the police are in the right. We’ve seen so many times before that the Met don’t tell the truth about these type of incidents.